If you’ve ever been inside an airport smoking room, you know they’re generally pretty depressing places, filled with thick clouds of heavy exhaust expelled by grim looking passengers trying to get in as many puffs as they can before boarding their flights and being stuck in that big no-smoking room in the sky for hours on end. 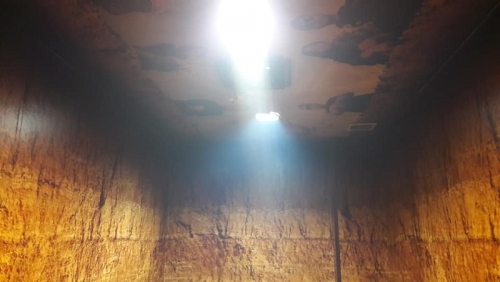 But while your average airport smoking room may be depressing, this one located inside Bandung’s Husein Sastranegara Airport is downright terrifying, at least according to this viral Facebook post by a user named Dode Yogiswara. In the Bandung airport. Went into the smoking room. The room is really cramped. Maybe about 2.5 x 1.5 meters in size. The walls are painted reddish brown like dirt. After lighting my cigarette, I looked up and there was a picture of some men and women sprinkling flowers down from above. I immediately didn’t feel good and quickly put the cigarette out and left. The post has been shared over 17,000 times since Dode uploaded it on Friday and attracted thousands of comments, with most praising the airport’s morbid design choice and some saying it should be expanded to smoking rooms nationwide. Andika Nuryaman, the airport’s general manager, told Detik that the goal of the room was indeed to remind people about the dangers of their habit. He said that in the year since the spooky smoking room has been open, more than a few smokers have complained about it and refused to go inside. Indonesia has some of the highest smoking rates in the world while also having some of the weakest tobacco control regulations, leading to over 200,000 tobacco-related deaths per year. Cigarettes have also been shown to be one of the greatest contributors to poverty in Indonesian households. Despite a majority of Indonesians agreeing that the government should increase the price on cigarettes to decrease demand, the central government has steadily refused to take any major actions that would decrease smoker demands.